Home > Membership > Nonprofit World > Can You Learn to Become a Better Leader? 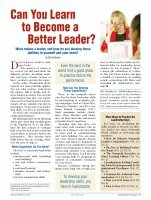 Can You Learn to Become a Better Leader? What makes a leader, and how do you develop those abilities in yourself and your team?